Carpinus caroliniana, commonly called the American hornbeam, is a slow-growing, deciduous, small to medium-sized, understory tree with an attractive globular form. It is native to Missouri where it is typically found in rich moist woods, valleys, ravine bottoms and rocky slopes along streams. It typically grows 20-35' tall. The smooth, gray trunk and larger branches of a mature tree exhibit a distinctive muscle-like fluting that has gives this plant another name ‘muscle wood’. Flowers appear in spring in separate male and female catkins, with the female catkins giving way to distinctive clusters of winged nutlets. Serrated, elliptic-oval, dark green leaves often produce respectable colorful shades. Enjoy a perfectly cool the shade on a hot day under the American hornbeam trees. It is a small- or medium-sized tree that prefers moist, acidic soils and performs remarkably well in full sun where it becomes denser and uniform with the proper amount of moisture. What’s more it withstands flooding, and is more tolerant of heat than other members of this genus. Buy this American hornbeam plant and you will be rewarded with a colorful display of leaves from yellow, orange, purple or red all year. It’s a wonderful addition to small yards and perfect for a naturalistic garden or as a specimen tree. The tree's look is enhanced by its crooked trunk and pendulous, zig-zagging branches which help attract wildlife. Finches, ruffed grouse and wild turkeys eat American hornbeam nutlets. 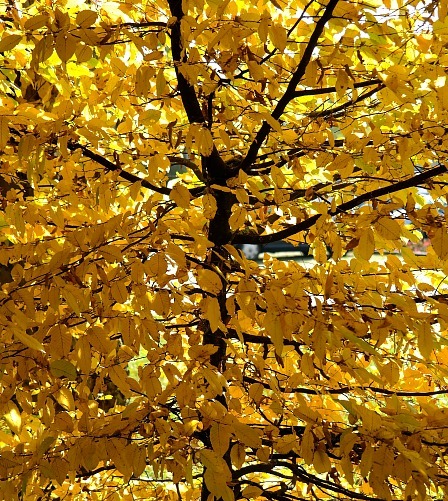 When planting the American hornbeam, ensure the soil is deep, fertile, and slightly acidic. You can choose to grow it as a multistemmed shrub or a single-stemmed tree. Hornbeam trees are growing in quart size containers. Orders shipping to CA or AZ may be bare rooted before being prepped for shipping.